I like to think I have some self-control when it comes to desserts. As in, I don’t typically pig out on what I bake. I’m more of a taste-as-I-go kind of gal, sampling my way through the making and baking process, and taking a bite (or, three) of the final goodie before sharing with whoever wants some. If I’m not baking, then I’m what’s called a dessert nibbler-yes, I did just make that up. I prefer to nibble on all available dessert options rather than commit to eating a single sweet. I’m just not ready to settle down with just one dessert. I like to give everyone their fair chance to win over my heart. 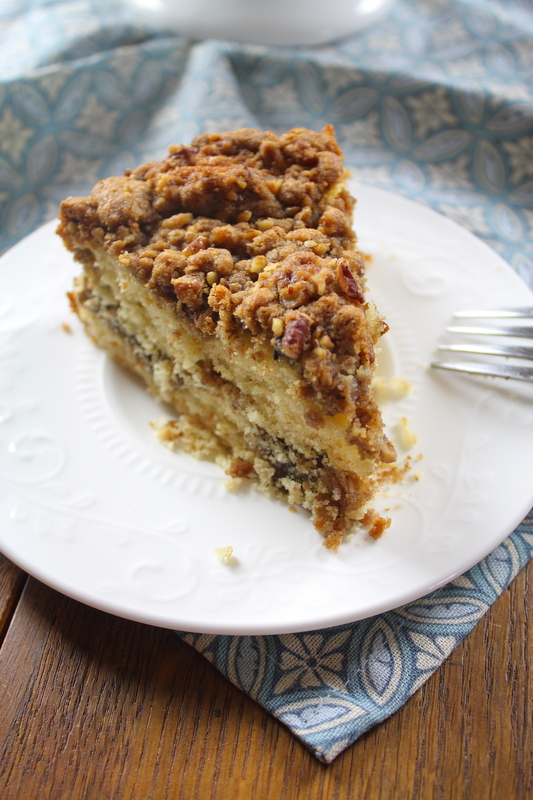 I’m going to openly admit, all self-control went out the window with this Cinnamon Pecan Streusel Coffee Cake. And, when I say all, I mean every single little ounce of self-control, completely gone. For starters, I couldn’t stop eating the batter. Why? I have no idea. It tastes like fluffy vanilla-yellow-cake yumminess and I was all but, sticking my face in the bowl, to eat it. No joke. I even scolded myself to stop while baking. Who does that? Crazy baking ladies, that’s who. Did I tell you that I not only made Cinnamon Pecan Streusel Coffee Cake in a cake pan, but also Cinnamon Pecan Streusel Coffee Cake donuts baked in a mini donut pan? 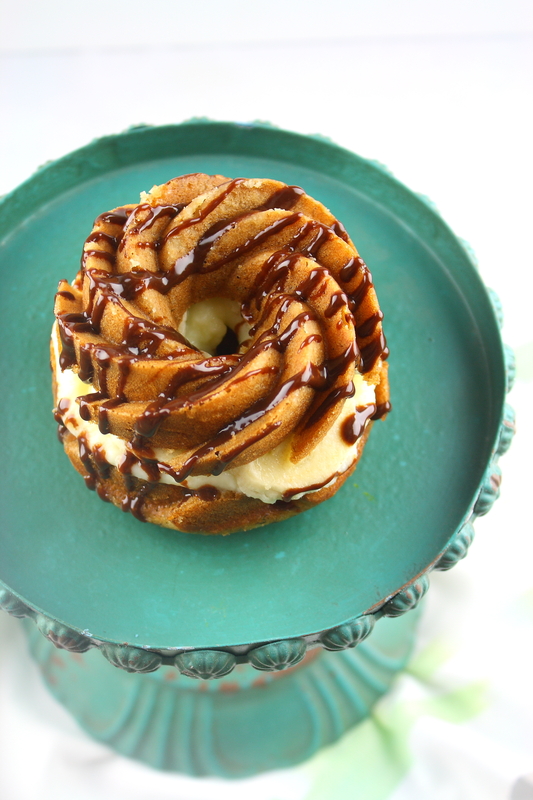 You see, I really really really wanted to make coffee cake donuts. So, I did. But, I got a little too excited while filling each donut well, and ended up with muffin top mini donuts that didn’t really come out of the pan in one piece. I blame the moistness of the cake. Seriously, it’s so ridiculously moist that it practically melts in your mouth. It’s an 11 out of 10 on the moistness scale. True Story. 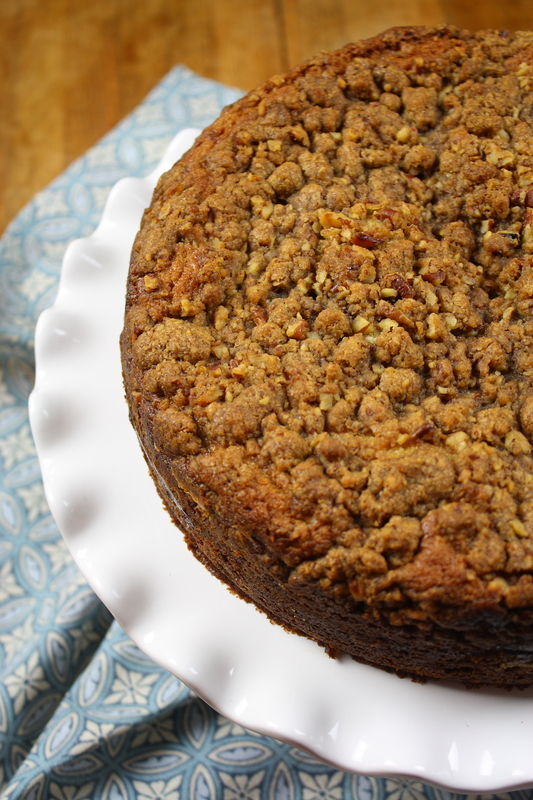 So, I have a whole cake and a baker’s dozen of deliciously edible but, not super pretty Cinnamon Pecan Streusel Coffee Cake(s) in my kitchen. Betcha wanna be my best friend now, huh? Want to hear how much I’ve pigged out? I’ve eaten four donuts (and counting). One before they had even cooled. Two before the cake had even finished baking. And my last one just because the cake looked so good, that I felt the need to eat another. Did I mention that was all in a matter of 30 or so minutes? Yeah, don’t judge me. I can’t help it. Really, I tried too. 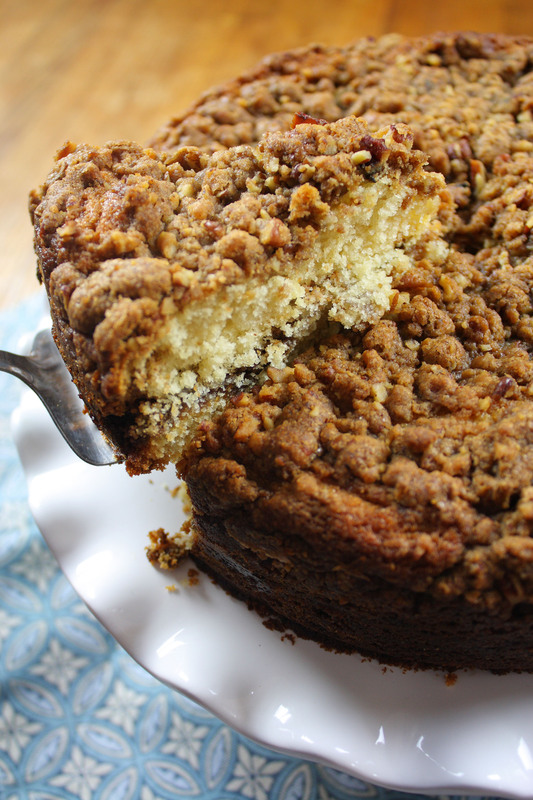 I offered some up to my mom, who like me, ate four donuts, and then simultaneously said we wouldn’t be sharing these with anyone, and that I was never allowed to make this coffee cake again. And then we ate a slice of cake, because, well, what else do mothers and daughters do when they are faced with deliciousness? The best part is, once the donuts are gone, I have a whole damn cake left. That tastes just as good, if not better, than the donuts. Insert delighted school girl squeal. And, a happy dance, which I just did around the kitchen. See, crazy baking lady in the house. Don’t worry, I know you love my craziness. 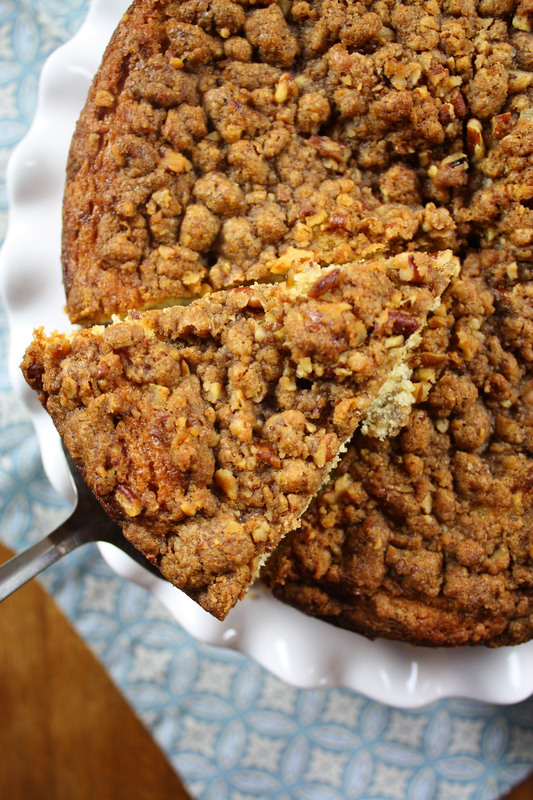 Because without it, you wouldn’t get this Cinnamon Pecan Streusel Coffee Cake. And without this cake, your mornings will be the worst. And when I say the worst, I mean worse than the worst. Doesn’t that sound bad? Cause it is. And, you don’t want that. So, do me a solid and make this. 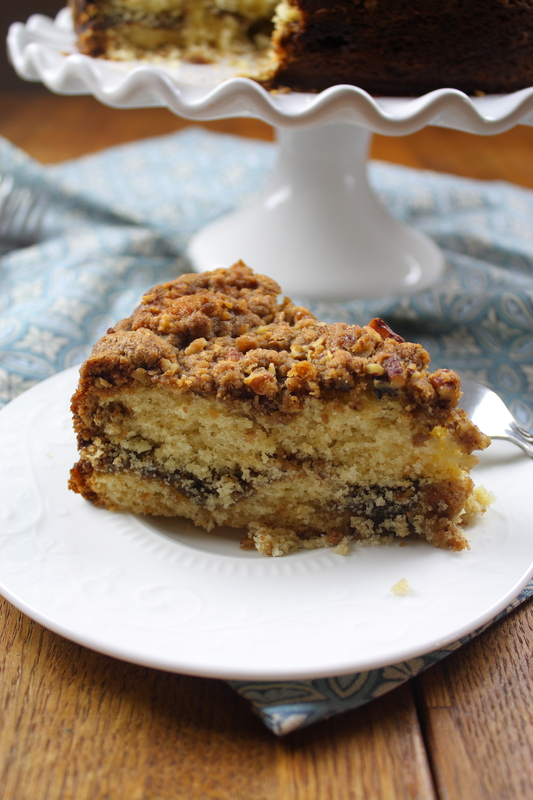 Or, better yet, come visit me so I can make you your own share coffee cake with you. Preheat oven to 350 degrees and grease an 9-inch springform pan. Set aside. In a medium bowl, whisk together all pecan topping ingredients–brown sugar, cinnamon, cocoa powder, salt, flour, pecans–except the butter, until combined. Cut in the butter using a pastry knife or your fingers until the mixture resembles coarse crumbles. Set aside. 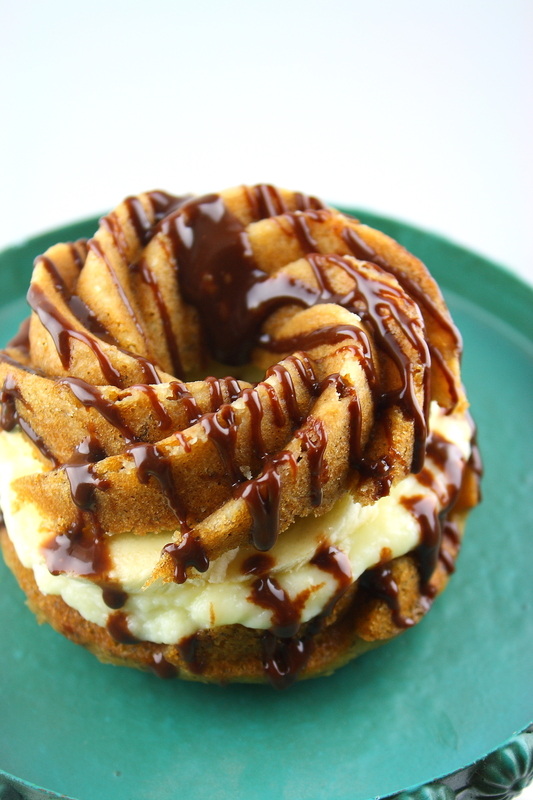 In a small bowl, whisk together all cinnamon filling ingredients. Set aside. 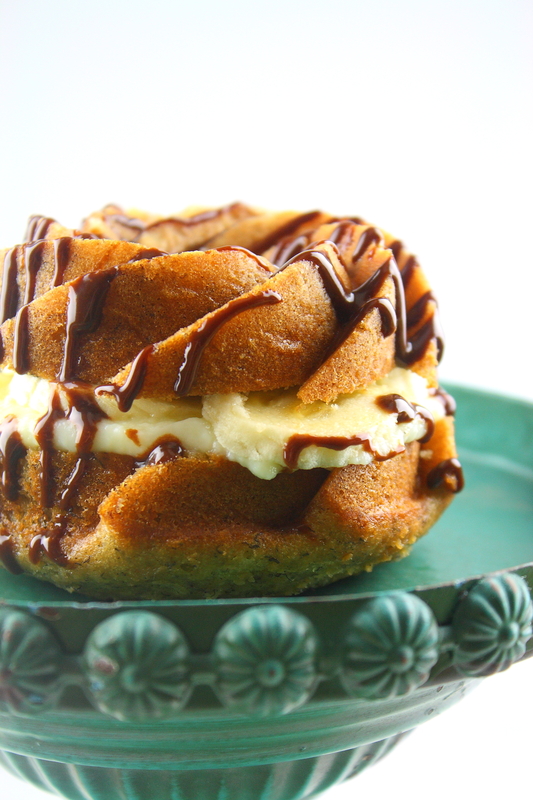 In the bowl of a stand mixer, cream together the butter and sugar until fluffy. Beat in eggs and vanilla until mixture is smooth. Add remaining dry ingredients, mixing until just combined. Scrape the bowl as needed. Mix in sour cream until incorporated. Pour half of the batter into the prepared springform pan. Sprinkle the top with the cinnamon filling, using a spatula to evenly spread. Top off with the remaining batter. Sprinkle the pecan topping over the batter, pressing lightly for it to stick. Bake for 45-50 minutes or until a toothpick inserted in the center comes out clean. If the top of the cake starts browning too much, cover the top with foil and place back in the oven to continue baking. Let cake cool completely before serving. It’s been way too long since we chatted. Way. Too. Long. A month too long, to be exact. It went to work. A lot of work. But, I can’t complain too much cause I actually really like my job. And, some weekend trips away from home aka the Hint of Nutmegg Kitchen. And, laziness. I’ll be honest, sometimes, on my days off, I just want to sleep. Or, I want to go out and tootle around. Or, I just have a ton of errands to run. And then, there’s the real kicker, the heat. I’m so, so so, over the damn heat. I want rain. I want clouds. I want to sit on the couch wrapped up in a blanket, drinking a PSL, eating a pumpkin cream cheese muffin. I want fall and I want it now. It’s simply impossible to have the oven on in my house with the heat. Impossible. That reminds me, I have something reallllly exciting to tell you. A few weeks ago I officially catered (well, the dessert portion of the event, that is) a baby shower! A friend of a friend saw the Baby Boy Cupcakes I made awhile back on Instagram, thought they were the cutest (I mean, they are pretty stinkin adorable), and asked if I could make them for the shower. Pretty cool, huh? Now, let’s move on to the important stuff. 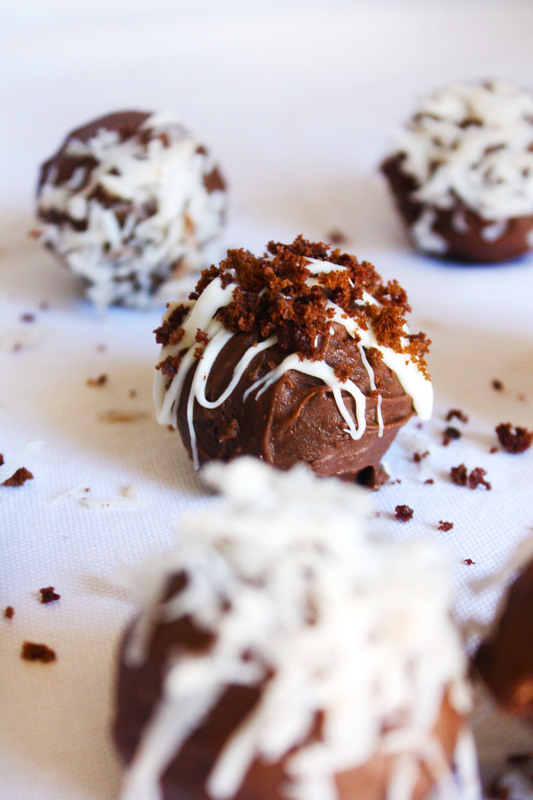 Coconut Chocolate Cake Balls. Some have even called them heaven balls. No joke. That’s a direct quote from a coworker of mine. 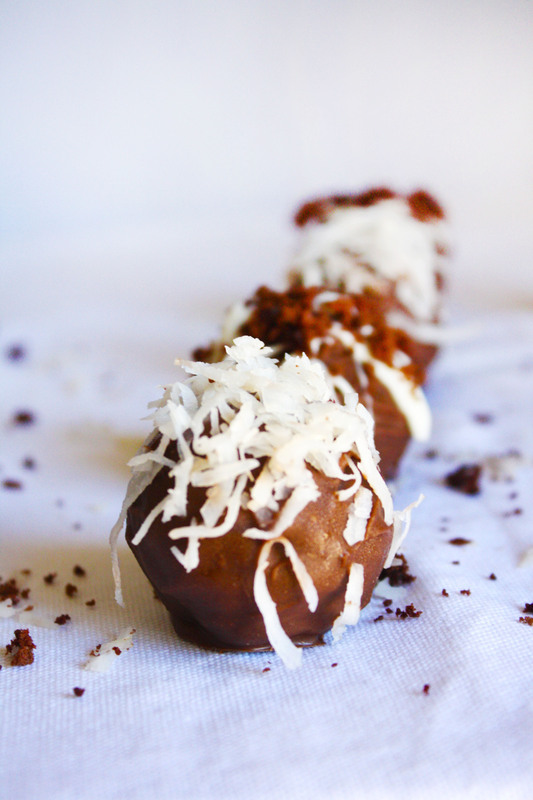 Moist chocolate cake mixed with coconut frosting, rolled into balls, dipped in chocolate, and sprinkled with shredded coconut. I mean, does it get any better than that? I don’t think so. Originally, my plan was to make cake pops…butttt, in my excitement, I made the cake balls a little too fat to stay upright on a lollipop stick, and there was also the fact that I didn’t have enough lollipop sticks for all the pops. Oops. So, I simply made cake balls. Problem solved. They were just as easy as making cake pops, just as yummy, and just a tad bit easier to eat because of the missing lollipop stick. Sounds like a win to me. But, guys, seriously, let’s not go this long without talking. I don’t like it. I’ll try my best (better than my best) to be around more often. Bake your cake according to the recipe or box instructions. Let cool completely. 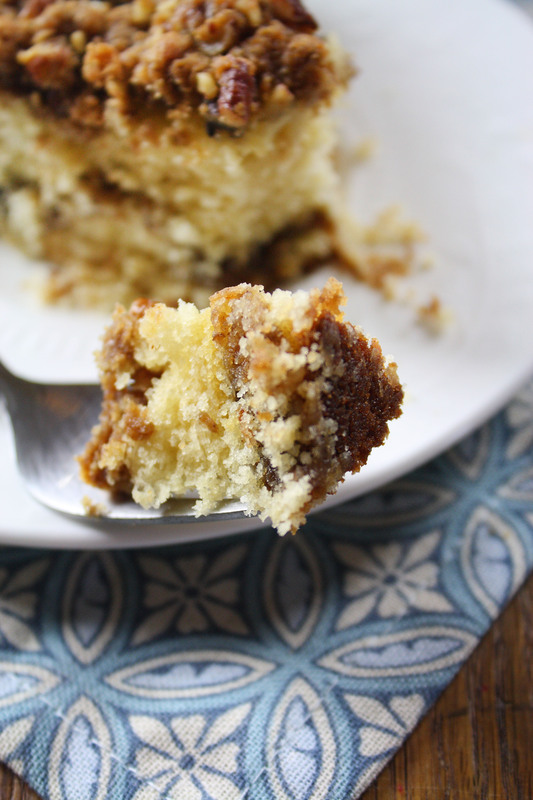 Once cake is cooled, use a fork, your hands, or a food processor to shred the cake into small crumbs—if you want to use cake crumbs for garnish, put some in a separate bowl at this time. Set aside. To make the frosting, beat the butter on medium speed until creamy. Add powdered sugar, heavy cream, shredded coconut, and coconut extract—this frosting is very adaptable to taste…if you want it sweeter add more powdered sugar, if you want less coconut flavor you can either lessen the amount of coconut extract or substitute vanilla extract instead, if it’s too thick add more heavy cream…just keep playing with the taste until you love it—beat until combined. Add ¾ of the coconut frosting to the crumbled chocolate cake mixture. Once combined, try to form about a 1-inch sized ball—the dough should be sticky enough to hold the shape of a ball, similar in consistency to cookie dough, if it’s too dry or crumbly add more frosting until it reaches the desired consistency. Place cake balls on a lined cookie sheet and let chill in the freezer for 30 minutes. When the cake balls are almost done chilling, melt your chocolate candy melts, in intervals of fifteen seconds, stirring after each interval, until melted. 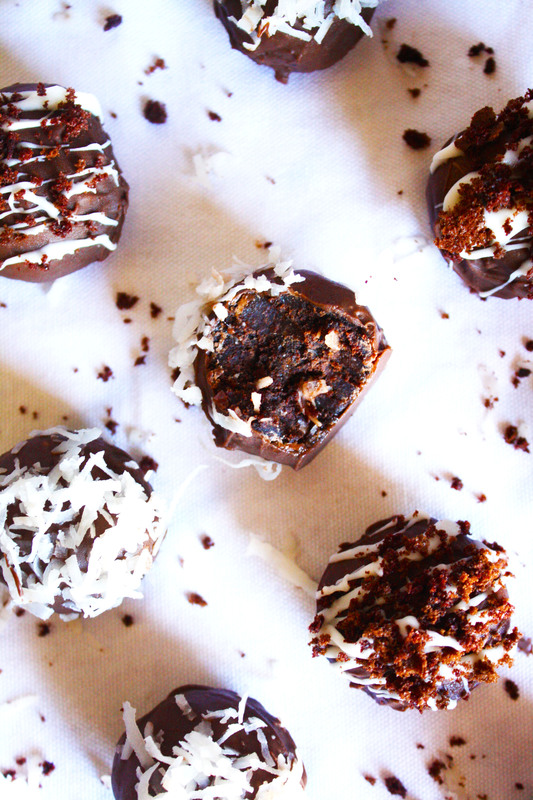 Coat each cake ball completely in melted chocolate—everyone has their own method of doing this, whether that be dipping it, spooning it on, or a combination of both (I prefer a combo of both)—and place on the lined cookie sheet. 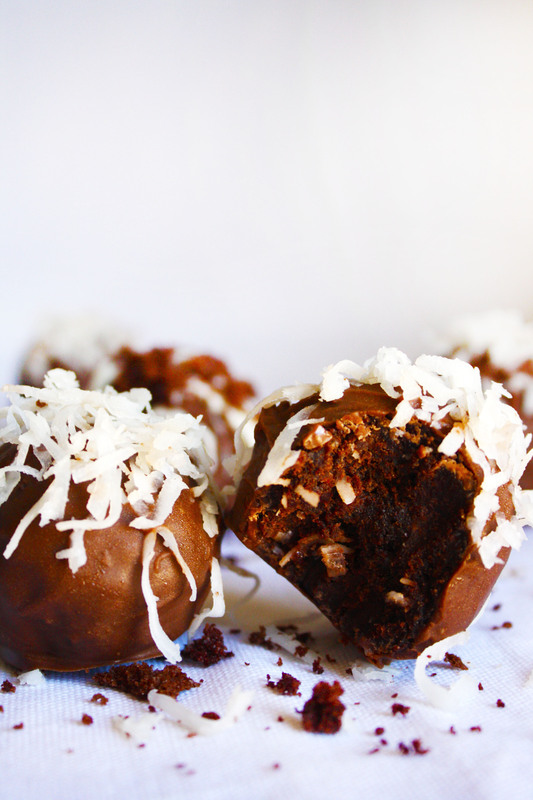 Working quickly, sprinkle coconut shreds on top of the coated cake ball and let sit to harden. Repeat until all cake balls are coated and garnished. 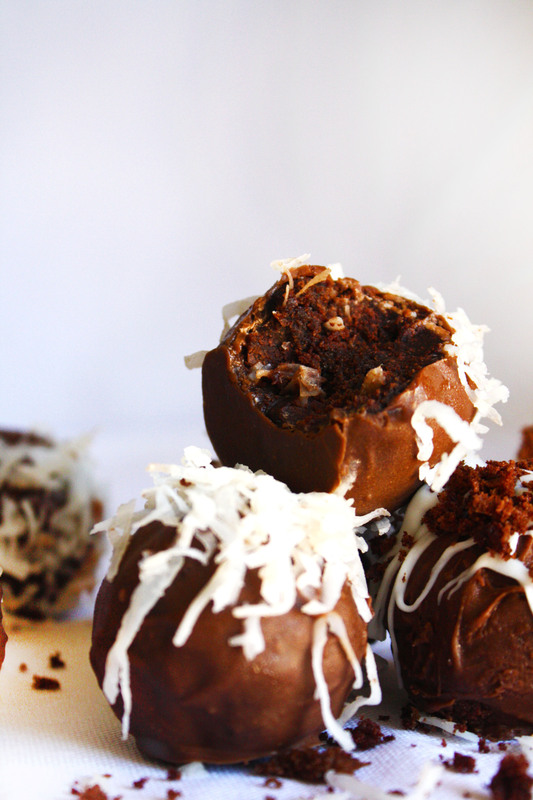 Alternatively, you can garnish your cake balls with a coconut candy melt (or, chocolate or white chocolate) drizzle and then sprinkle with the reserved chocolate cake crumbles. There is less than a week before summer. Well, more specifically, in five days it’s the first ‘official’ day of summer. Emphasis on the official part. I’ve always been one to mark the first day of summer by the last day of school or the first day in June, which means I’m about seventeen days into my summer. But, hey, that could just be me. I have a tendency to go off book when it comes to holidays or events labeled on calendars. Little known fact about myself: I like to celebrate (if I remember that is) the random, obscure, and definitely-not-listed-on-any-calendar national holidays. National Yogurtland Day? Best believe I’m waiting in line to eat my weight in free frozen yogurt. National Donut Day? Why, hello, Krispy Kreme drive thru, where have you been all my life? National Siblings Day? Instagram will be blown up with pictures of my brother and I, mainly because we were adorable kids, but also because the holiday demands it. Who am I to ignore these wonderful national holidays? But, better question, who are you to ignore them? Maybe it’s just me, but I find these kinds of days to be fun. I believe it’s the little things in life that make you happy, and these national holidays are the epitome of the little things. But, before I get more philosophical on you, let’s get back to the first official day of summer. A day that is listed on calendars, but not given very much attention on the celebration scale. I vote we change that. I think it should be celebrated. 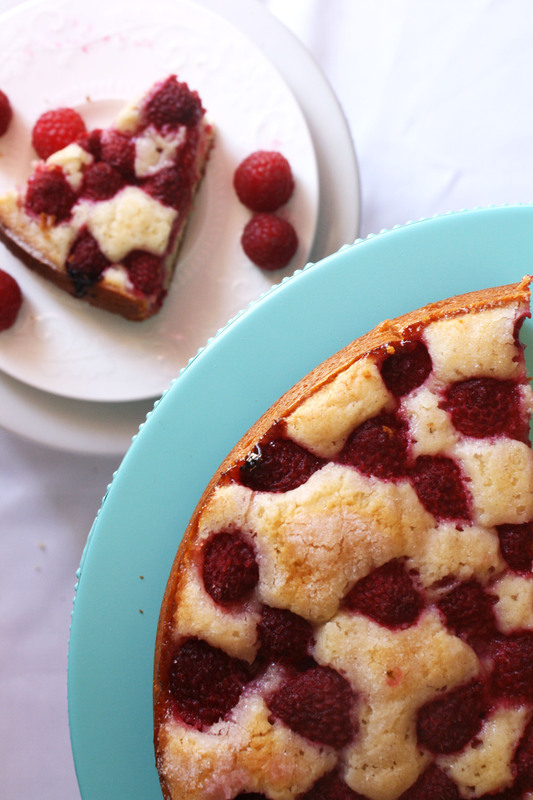 And, what better way to do that than a Raspberry Buttermilk Cake? Yeahh, I’ll answer that question, there is no better way to celebrate it. So, if I were you, I’d join me. Like now, before the entire cake is eaten. 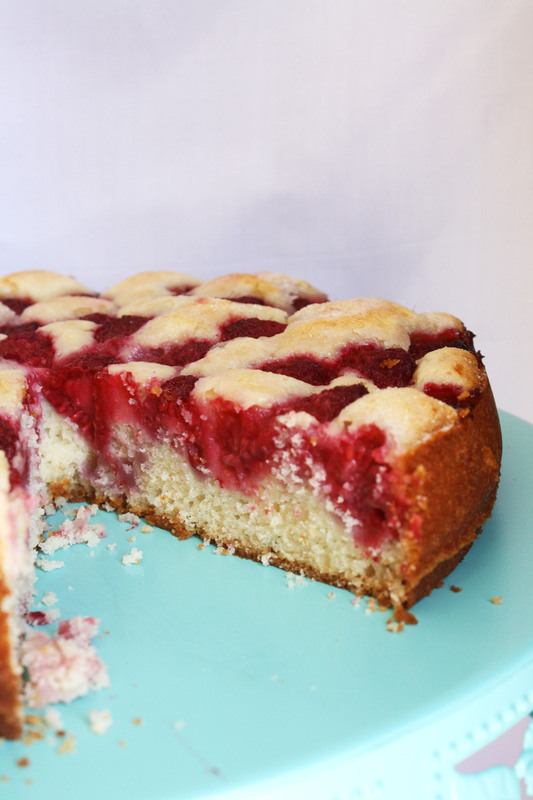 Raspberry Buttermilk Cake. Funny story. I don’t ever have buttermilk or raspberries, for that matter, in my fridge. It’s just not something I buy with frequency. Actually, if we are being completely open, this was my first time buying raspberries. I know, how weird, right? Raspberries just aren’t my thing. In fact, the only berry that is my thing is a strawberry. Again, I know, how weird. But, Costco had a sale. And raspberries scream summer. And, okay, fine, there wasn’t a good-looking box of strawberries left. So, the raspberries found themselves in my fridge, sitting next to a half-opened carton of buttermilk, which I had used to make a healthy potato salad (substitute buttermilk for mayo…surprisingly quite tasty) a few days before. 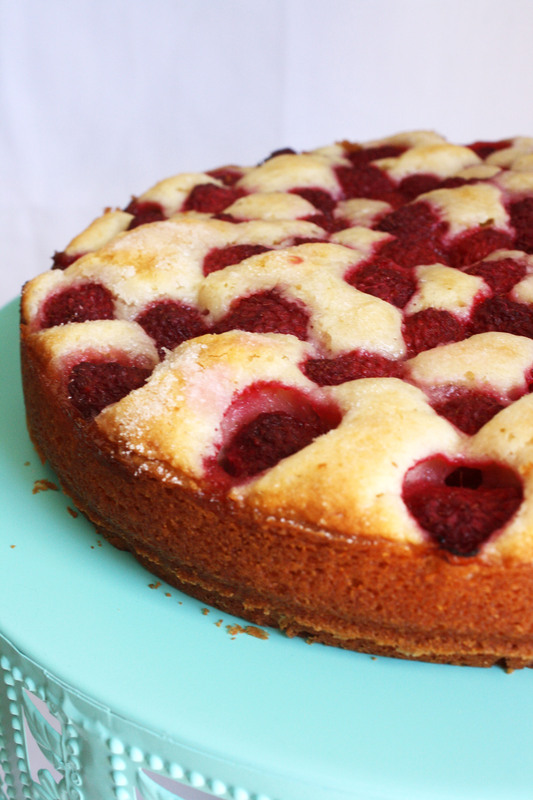 And then I saw a recipe for a Strawberry Summer Cake on Smitten Kitchen. 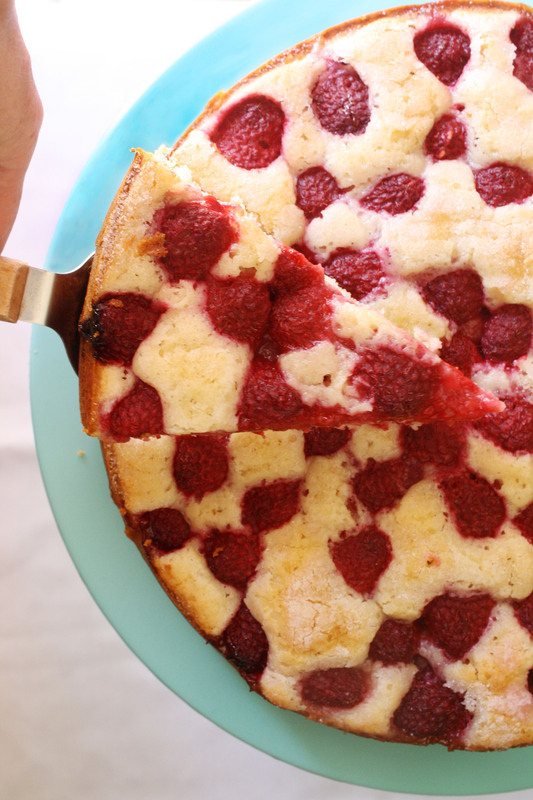 I think it was the world’s way of telling me to grab the raspberries and buttermilk and make a cake in honor of the first day of summer. And, when the world speaks to you like that, you don’t even think about it, you just do. So I did. And, can I just say, I’m glad I did. 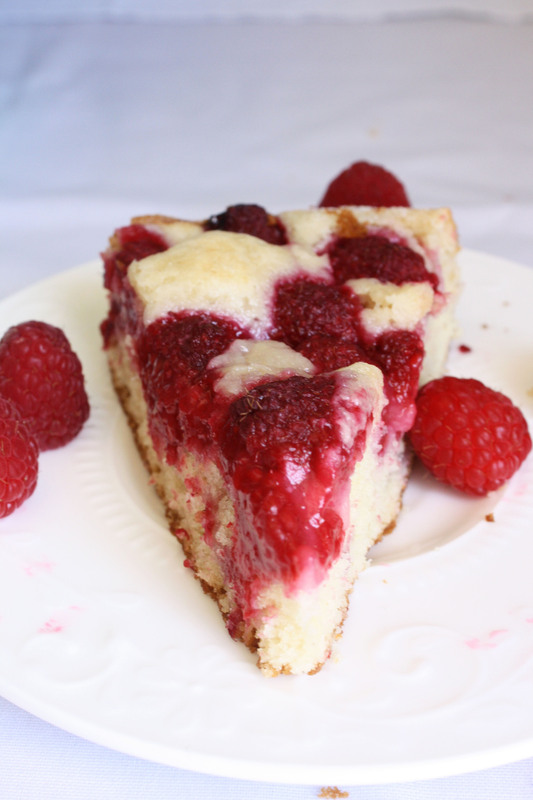 The buttermilk cake is super moist, flavorful, and pairs rather nicely with the tartness of the raspberries. As the cake bakes, the raspberries turn into puddles of jam that soak into the cake, making your house smell amazing and your stomach grumble in anticipation. This dessert isn’t overly sweet, but I found a hefty spoonful of homemade whipped cream definitely makes up for that. 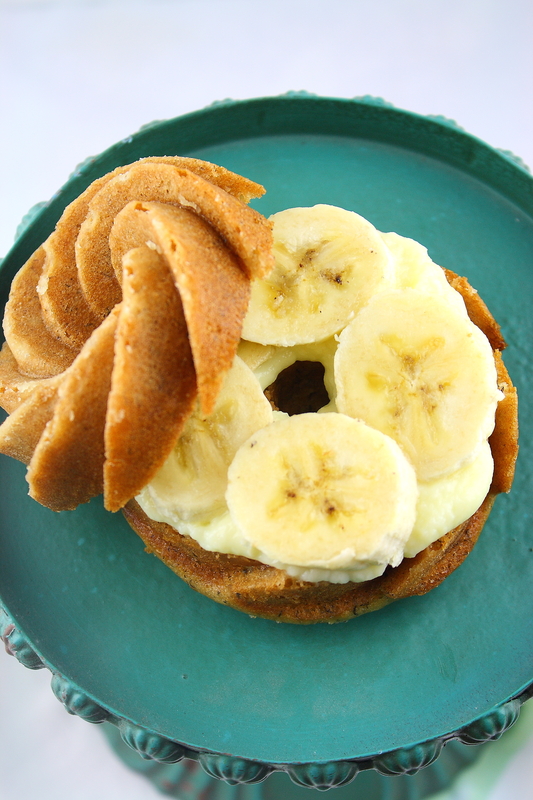 It’s a light, summery, easy-to-put-together kind of dessert—so, basically, the ideal way to celebrate the first official day of summer if you ask me! Preheat oven to 350 degrees, and butter a 9-inch springform pan (or cake pan or deep dish pie pan). In a small bowl whisk flour, baking powder, and salt. Set aside. In a large bowl beat butter and 1 cup of sugar until light and fluffy, about 3 minutes. Mix in egg, buttermilk, and vanilla until well combined. Gradually add the dry ingredients to the wet ingredients, mixing until just smooth. Pour batter into prepared pan, smoothing the top with a spatula. 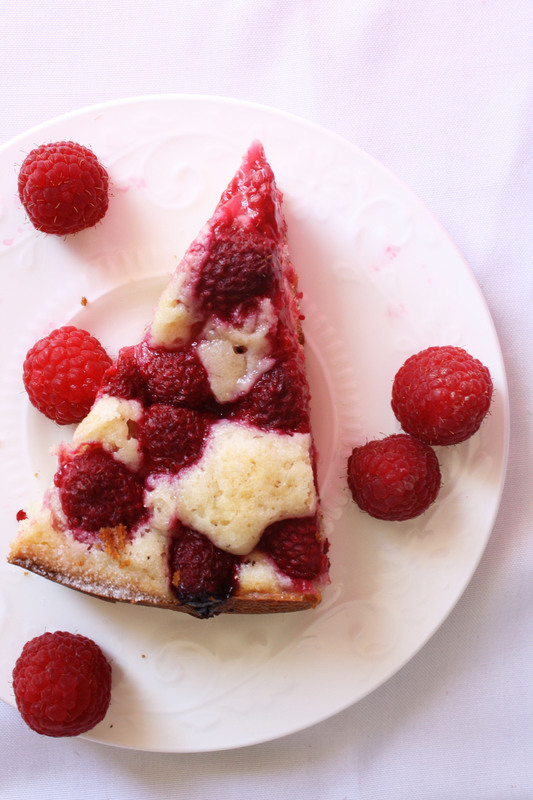 Arrange raspberries, bottoms up, on top of the batter in a single layer. Sprinkle, as evenly as possible, remaining 2 tablespoons of sugar over the berries. Bake cake for ten minutes then reduce oven temperature to 325 degrees and continue baking for 50-55 minutes until golden brown and a toothpick comes out clean (gooey raspberries on the toothpick are a given). Let cake cool in pan on a wire rack. 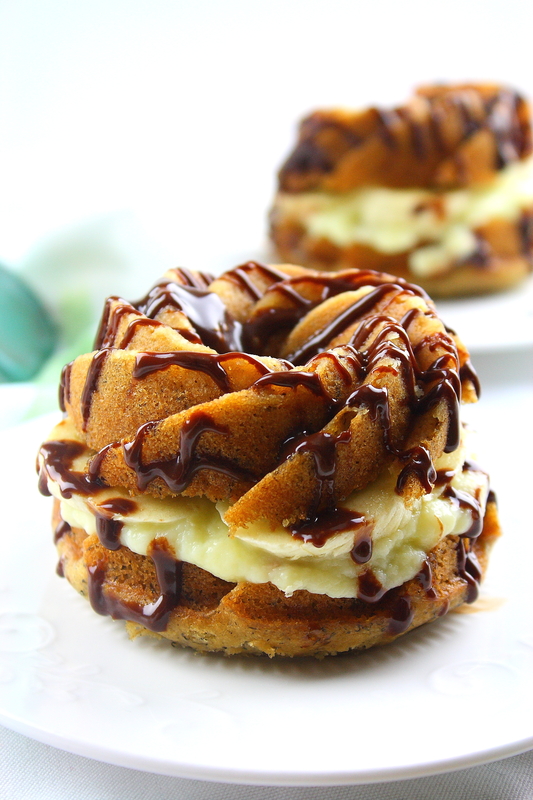 Cut into slices and serve with whipped cream. Sometimes you just need something over-the-top. By need, I really mean deserve. 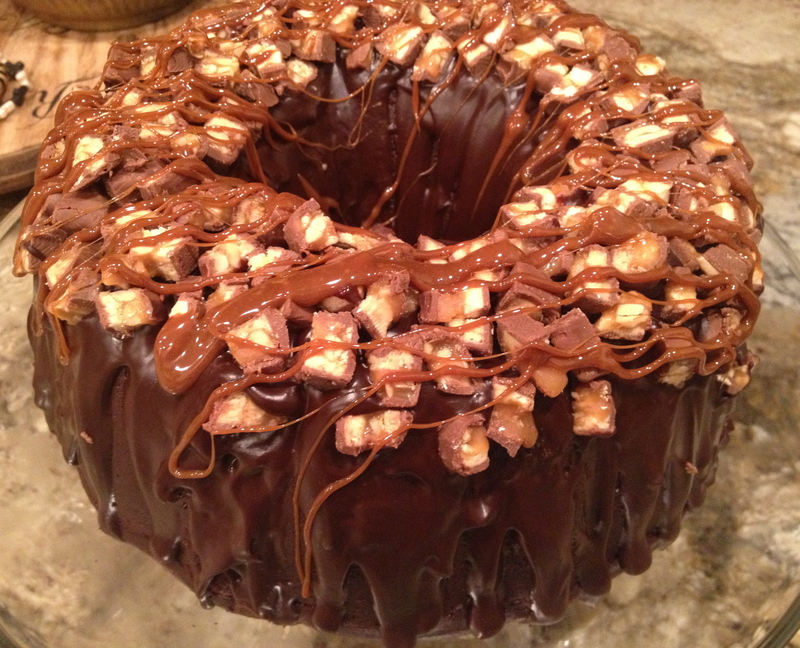 As in we’re celebrating my Dad’s birthday and he needs a slice of Double Chocolate Snickers Bundt Cake. Or, I spent the week studying for the GRE and am stressing like crazy, so I need a slice (or, three) of Double Chocolate Snickers Bundt Cake. 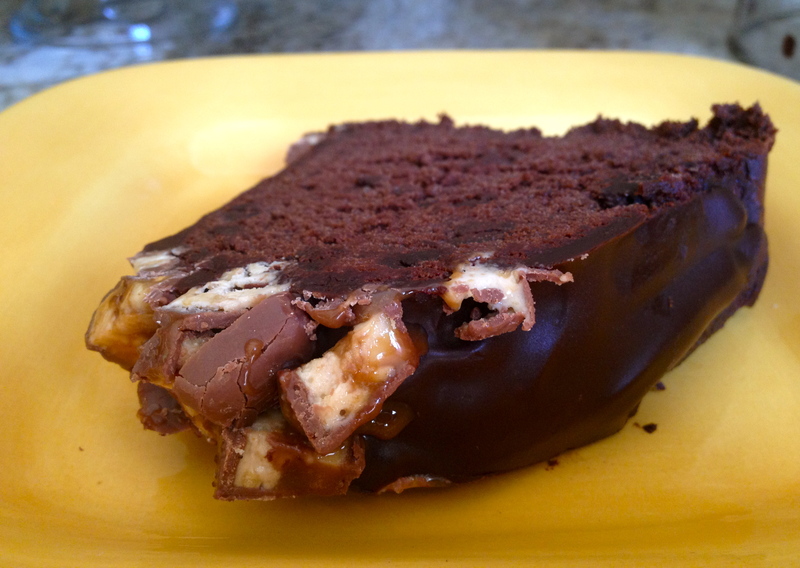 Or, insert any type of accomplishment, event, or mood (regardless if it’s good or bad) and you need a slice of Double Chocolate Snickers Bundt Cake. And by that other part, the ‘over-the-top’ part, I really mean something so decadent, so chocolately, so delicious that you won’t even feel guilty eating a slice because it instantly makes everything (and, I mean everything) much better. Sometimes we deserve to treat ourselves, or need a pick me up, or need to celebrate. Sometimes we need something to make our day a little better, our stomachs a little fuller, and our smiles a little wider. For these days, I usually turn to dessert, and if you’re like me, then I just found us the perfect go to dessert. 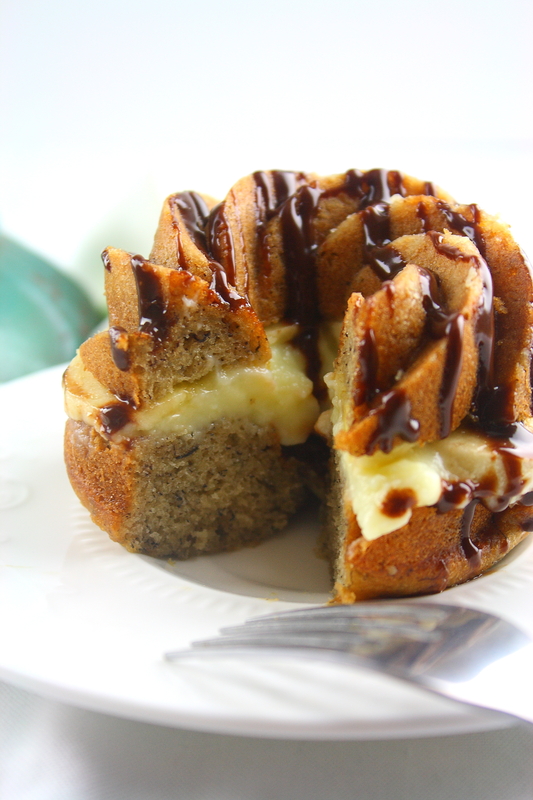 Hello Double Chocolate Snickers Bundt Cake. Where have you been all our lives? In one word I would describe this cake as rich. As in, you’re going to need a large glass of milk or a heaping scoop of vanilla ice cream to eat with any slice. 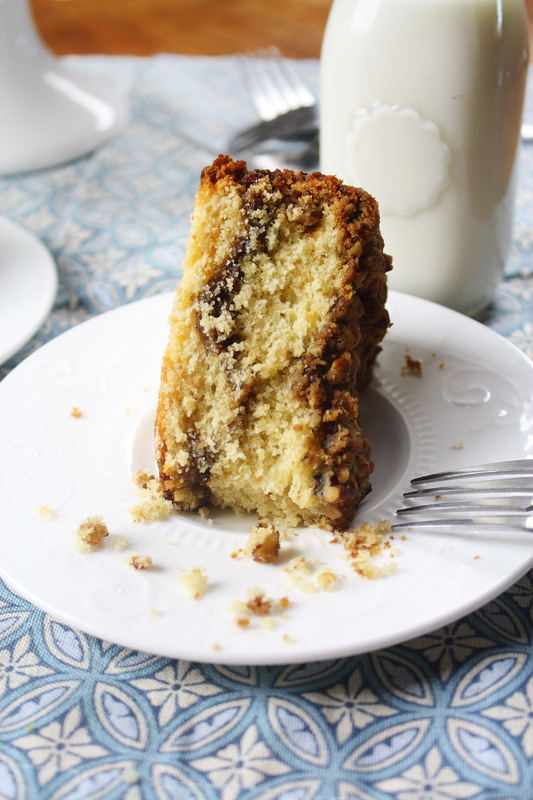 The cake itself is extremely moist and chocolately both from the semi-sweet chocolate and the chocolate chips (which, melt slightly while the cake is cooking). The ganache is very rich and velvety, adding yet another chocolately texture to the cake. The caramel and Snickers toppings, which I highly recommend, give the palate a break from all the chocolate and really add the perfect final touches to this decadent dessert. Preheat oven to 325 degrees. Grease and dust Bundt Cake pan with cocoa powder. In a medium bowl, combine semi-sweet chocolate and cocoa powder as much as possible. Add boiling water and whisk until chocolate melts and mixture is smooth and blended. Set aside. In the bowl of an electric mixer, beat the butter on medium speed until smooth and creamy. Reduce speed to low and add brown sugar. Beat until just blended. Increase speed to medium and continue beating the mixture until light and fluffy. Add the eggs, a little at a time, until well combined. Add the vanilla. Mix until combined. Reduce speed to low and alternate between adding the flour mixture and sour cream, starting and ending with the flour mixture. Mix until well combined. Slowly mix in the chocolate-cocoa mixture. Beat until no white streaks are visible. Using a rubber spatula, fold in chocolate chips. Pour batter into prepared pan (mine was full to the very top) and bake 65 to 75 minutes or until a toothpick comes out of the center with only a few moist crumbs. Let cake cool for about 15 minutes upright before inverting the pan and lifting it off the cake. Let cake cool completely, at least 1 hour (I let mine sit over night). In a glass bowl, combine semi-sweet chocolate and butter. In a small saucepan, over medium-high heat, bring heavy cream just to a boil. Immediately pour heavy cream over chocolate and butter. Whisk until mixture is smooth. Pour ganache over top of cake, allowing for some to drip down the sides. 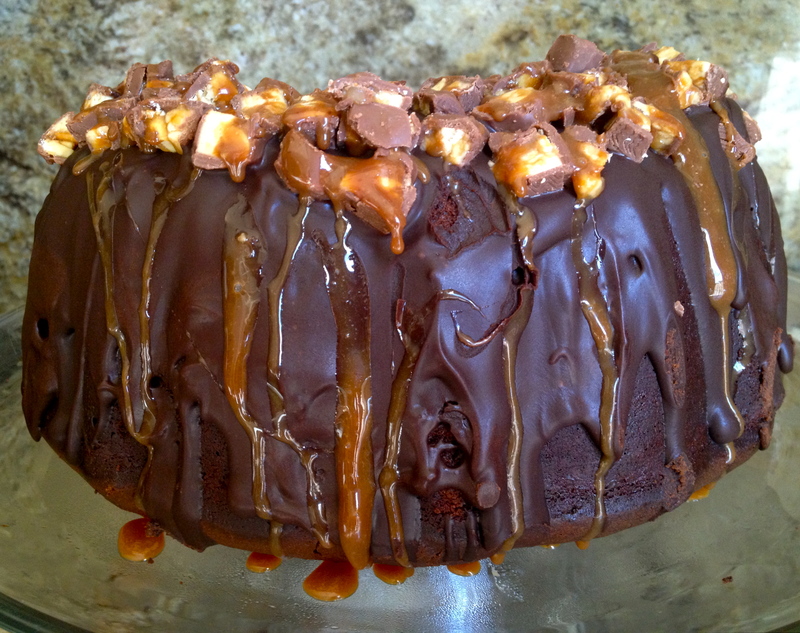 Once the top of the cake is covered with ganache, gently place cubed Snickers pieces all around the top. Let cake sit until the ganache is set, at least 15 minutes. 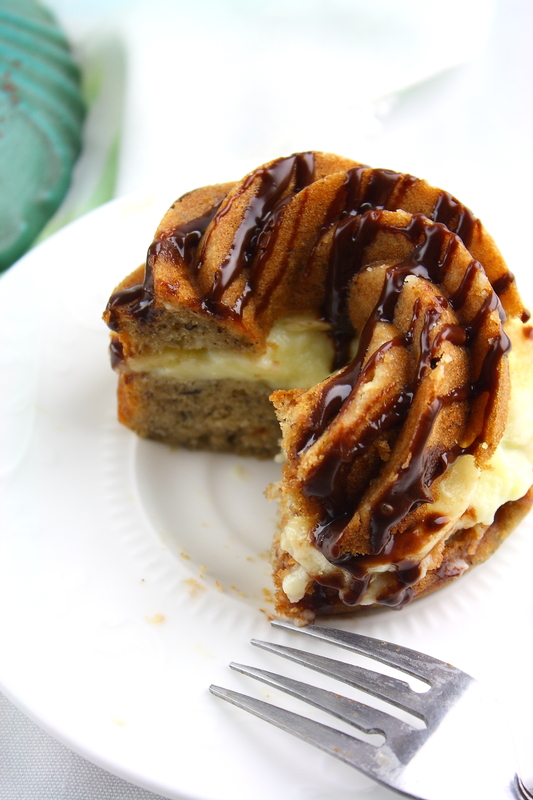 Drizzle the top of the cake generously with caramel.